We finally made it! With our close friends, Steve and Kim, we cruised on one of the biggest class of cruise ships in the world, the Explorer of the Seas!!! Along with the original ship of the class, the Voyager of the Seas- and their sisters the Adventure of the Seas, Navigator of the Seas and this year's Mariner of the Seas- the Explorer of the Seas is a cruise ship of such immense dimensions (they weigh in at 142,000 tons- the next class of ship to come close hovers around 100,000 tons, and the vast majority of cruise ships are below 80,000 tons!) that the cruise ship itself actually becomes a destination. The ship is HUGE- and the added space is a pleasure. 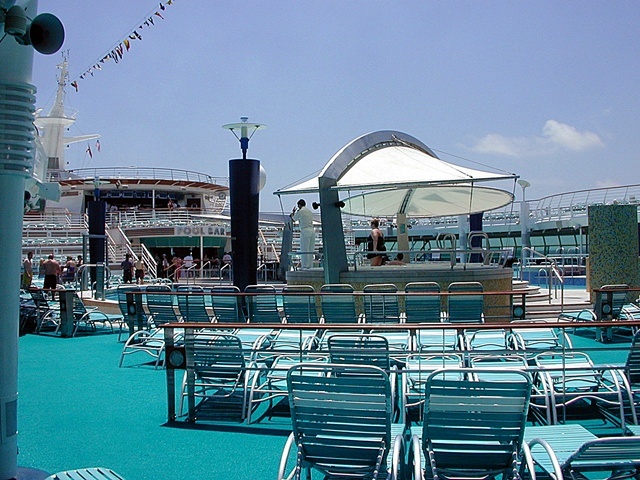 (The Voyager of the Seas is said to have it's own zip code- I forgot to find out if the others in the class do as well). The commercials for this ship, the pamphlets, the advertisements- none of it compares to the real thing- this ship is by far the most incredible cruise vacation we've ever experienced. In fact, we now have no interest in cruising aboard anything but this class until we've done them all! Without a doubt, this was the BEST cruise and BEST vacation we've had to date! 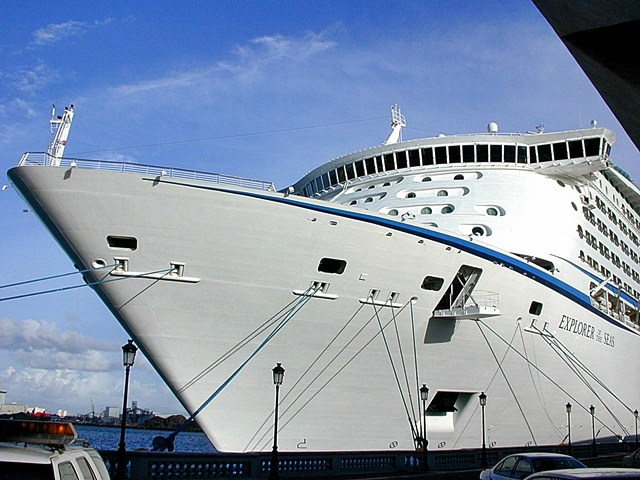 Update 2009: the Voyager class ships are no longer the largest cruise ships. That title belongs with their larger sisters, the Freedom class ships, Freedom, Liberty and Independence of the Seas... for now. Later this year, the biggest ship ever will debut, the Oasis of the Seas (also from RCCL) and in 2010, the Allure of the Seas. We did eventually score almost all of the Voyager class... only Adventure has eluded us. We also have been lucky enough to cruise on the Freedom and Liberty of the Seas and hope to one day sail aboard the Independence of the Seas. The Freedom class weigh in at 160,000 or so tons. Oasis will come in at around 220,000 tons. Islands throughout the Caribbean are building docks large enough to handle her as fast as they can! Navigator and Explorer, bow to bow! 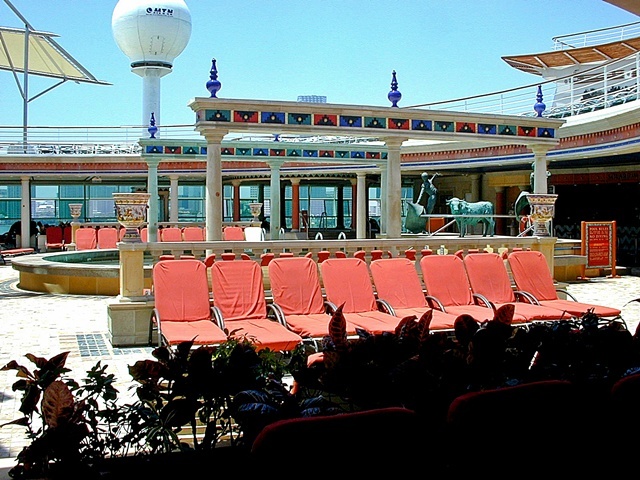 This ship has so many amenities and places that it's difficult to pick a favorite- but personally, my favorite place is the "Royal Promenade"- a four story, 120 meters (390') long central "street" running through the very heart of the ship! You actually feel as though you're in some quaint little town perusing the shops and pubs- and you often lose track of the fact that you're inside a ship! We had a great time walking up and down the "avenue" - going into the bars, eating at the restaurant, and shopping. We also enjoyed the actors who engaged the passengers in silly banter throughout the day. The Royal Promenade also had at least two parades while I was on board. 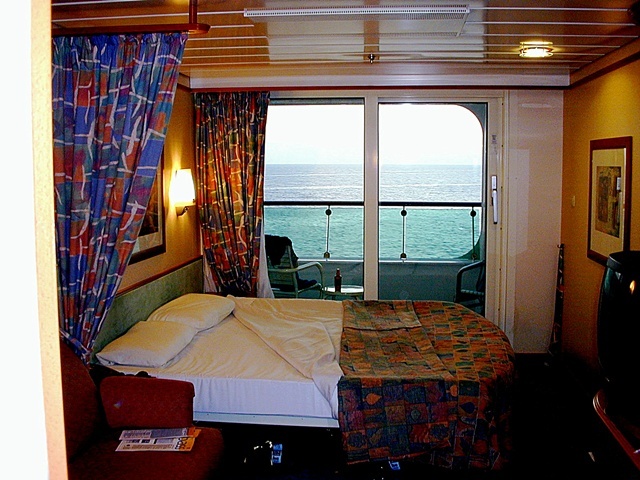 Update 2009: Still the coolest place aboard the Voyager and Freedom class ships. The "street" actors and clowns have long since disappeared, but the parades are still held at least twice per cruise. Explorer cabin in '03... note the old fashioned bed and bedding! Below the Royal Promenade is an immense casino - and there's a two story disco called, "The Chamber" festooned with medieval suits of armor and gargoyles- a fantastic late night destination. There's the three story theater up at the bow featuring RCCL's typically very entertaining shows, but there's also the ice skating rink on another deck that has two exquisite shows during the 7 day cruise (GET TICKETS for this show as soon as they become available). Aft is the three story main dining room- very beautiful in it's appointments, but there's also the incredibly upscale and reservations only "Portofino" Italian restaurant that's a bargain at a mere surcharge of $20/person. (Expect to pay 5 times that to eat at such an upscale restaurant in the real world). There's also Johnny Rockets serving up burgers, dogs and malted milkshakes- and of course the line's venerable buffet location, the Windjammer (also called the Island Grill) Cafe. 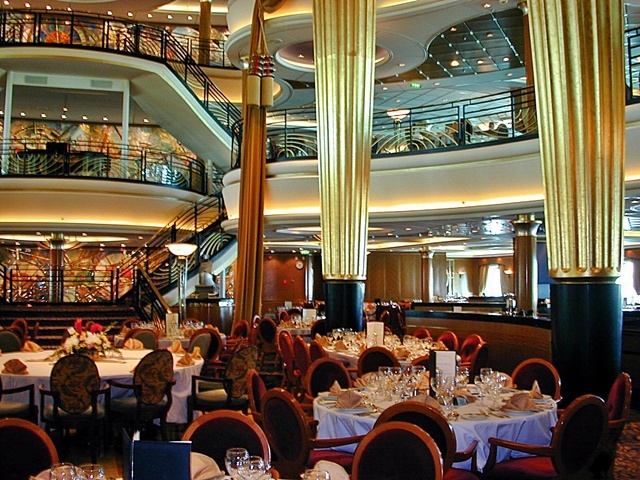 Needless to say, you'll never have a hard time finding something to eat on this ship (or any other respectable cruise ship- but this one has food options everywhere). 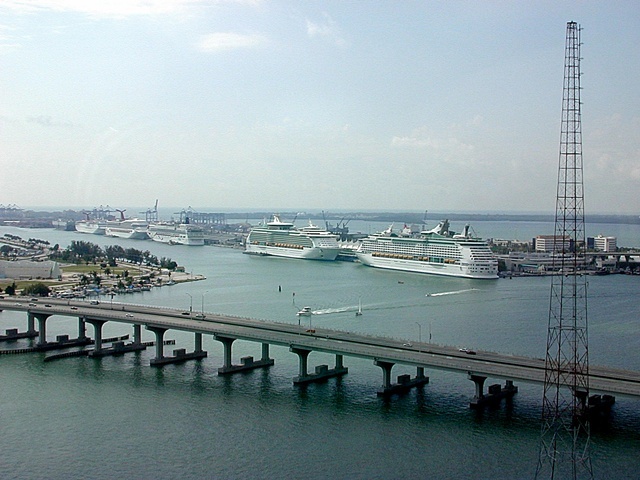 Our ports on in this voyage were from Miami: a day at Sea (a pleasure on a ship this big! ); San Juan, PR (we toured a rum distillery- my recommendation, stay on the ship next time); St. Martin (absolutely don't miss the La Playa beach at Orient Bay!!! ); St. Thomas (Magen's Bay or a trip to St. John's Trunk Bay beaches are a must! ); another day at Sea (we ice-skated and golfed and explored this incredible ship! ); Nassau in the Bahamas (do the Yellowbird rum cruise or just stay on ship- not much here on this island. ); then back to Miami. The ship itself is so much fun, it wouldn't really matter to me if it was a cruise to nowhere. What can I say? I learned to ice skate (after a very shaky and slow start- I got the hang of it- and I didn't fall down), I saw an ice show, I saw terrific shows in the main theater, I played miniature golf (in the middle of the Caribbean sea!) 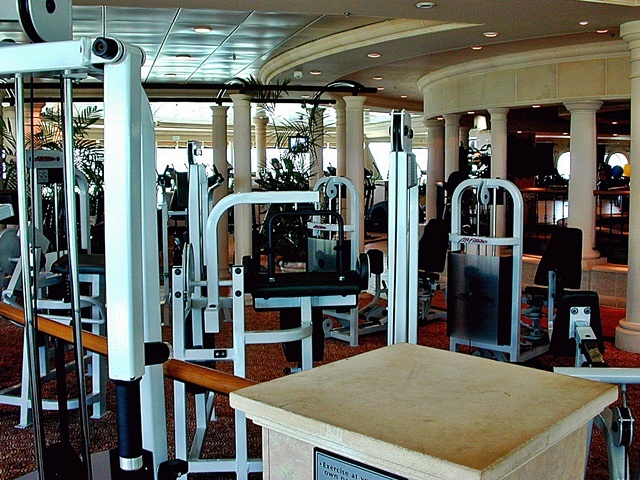 and used a golf simulator to work on my driving skills (which have withered considerably since I was a teenager), I worked out in an incredible gym, I watched the stars from the front of the ship, I watched bridge operations from the "peek-a-boo" bridge over top, I almost did the rock climbing wall (a foot injury the week before the cruise made me decide not to do this), I danced the night away in an incredible disco and laughed at the singers in the pub, I gambled in the casino, I swam in the pool and sat in the hot tub at 2am- there's always at least one pool and hot tub open 24 hours (!) on this ship... In short, all of us, Steve and Kim and Diane and I had a great time! To see some more photos from this wonderful cruise, press HERE!